For those who have been a part of 4-H know the green in the logo represents life, growth, and youth. The white symbolizes purity and high ideals. The 4-H Pledge: to pledge your HEAD to clearer thinking, your HEART to greater loyalty, your HANDS to larger service, and your HEALTH to better living, for club, community, country, and the world. 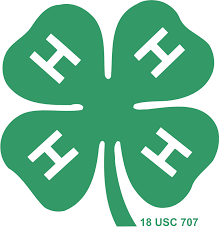 For more information about 4-H in Coconino County click here.